Most people who know me are fully aware of several truths in my life that lead me to need a good battery-powered, hands-free headlamp to light my way at night. For those who are just meeting me, let’s review: A) I adore my pets and love taking my dogs on a walk; B) My husband and I are on second-shift schedules so there’s a lot of late-night working when most “normal” hour people are already in bed; and C) like approximately 19 percent of the US population, I am a person with a disability. To be specific, I am a full-time wheelchair user. Combine all three of those facts and I had a bit of a conundrum. I love spending time with my dogs outside, but usually only had time at dusk or even later. 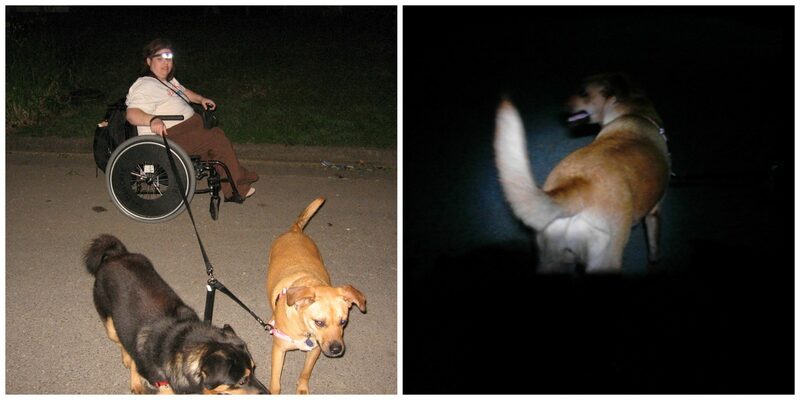 Not exactly safe to go walking outside with dogs and a dark wheelchair when it’s night! That’s where I got rescued by the Energizer Bunny! 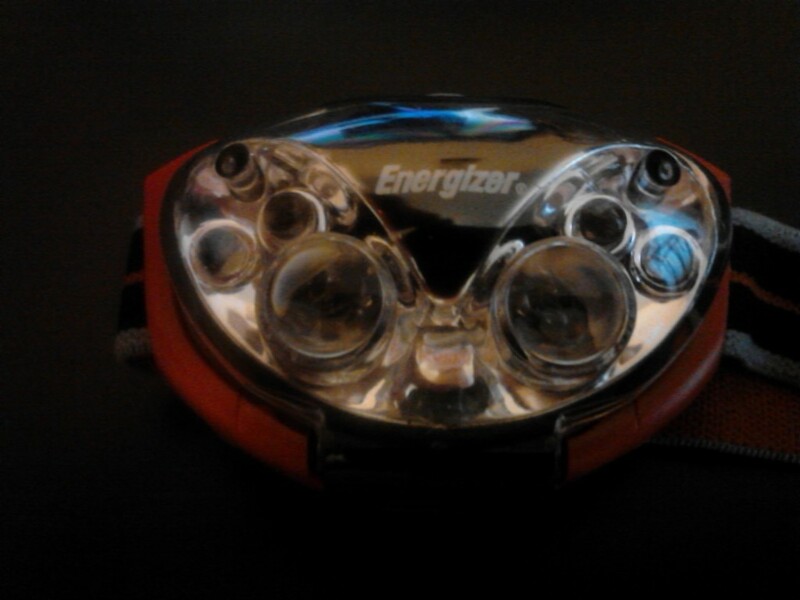 This headlamp from Energizer is a perfect way to #LightMyWay. It has four modes, which really help me when doing various tasks in the dark. I had asked for suggestions on Facebook for some kind of device or way that I could make the situation safer. I was already using reflective collars on the dogs but that didn’t seem like enough. Another friend suggested I use one of those orange strobe light things but that didn’t seem like it would work for cars to see me from multiple angles. 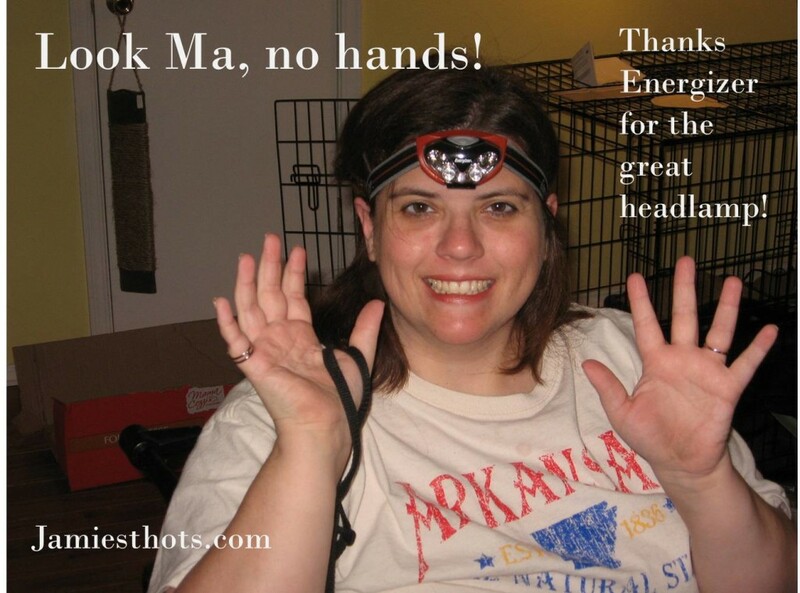 Yet another friend suggested I use a handlight… you know, like spelunkers use? I discarded that idea because I figured it would not be in my budget. Boy was I wrong! I was so thrilled to get the chance to check out the headlamps from Energizer and I was pleasantly surprised at how affordable they were. 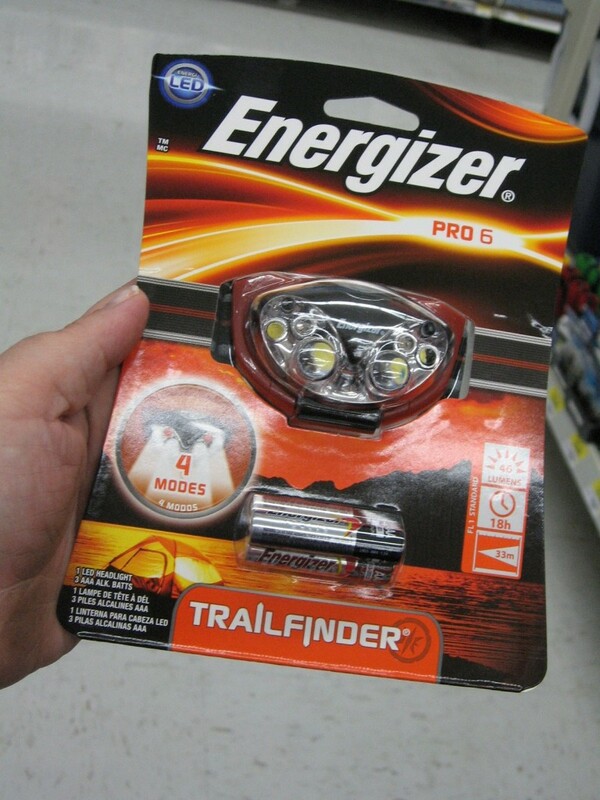 In case you want to run out and get your own, I will tell you that Walmart has at least four options for the headlamps from Energizer alone. (You can follow Energizer on Facebook to learn more about their products, by the way. I know I’m going to! You can also check out my Google+ album to see what my shopping experience was like). There are different powers and different features on each. I went with the one that has four modes because it allows me to choose how much light and how broad of a beam I want in a given moment. Both of my dogs make an appearance in this photo collage. Flower (the black and tan shepherd mix) is a little camera-shy. The Black Mouth Cur mix named Jazzy is a bit more camera friendly. She usually walks on the left side and is more prone to me running into the back of her if I’m not careful. Now I can see where I’m going! I won’t lie, I kinda get a kick out of using the red “night vision” mode. It only lets cars see me and doesn’t give me extra vision, but I couldn’t help but hum the Mission Impossible theme song when I tried it out. Most the time I use the most focused beam because I just need cars to be able to see me and I need to be able to see my dogs in front of me so I don’t run into them when rolling down the street (sometimes they stop and if I don’t see that, it’s not fun for anyone). 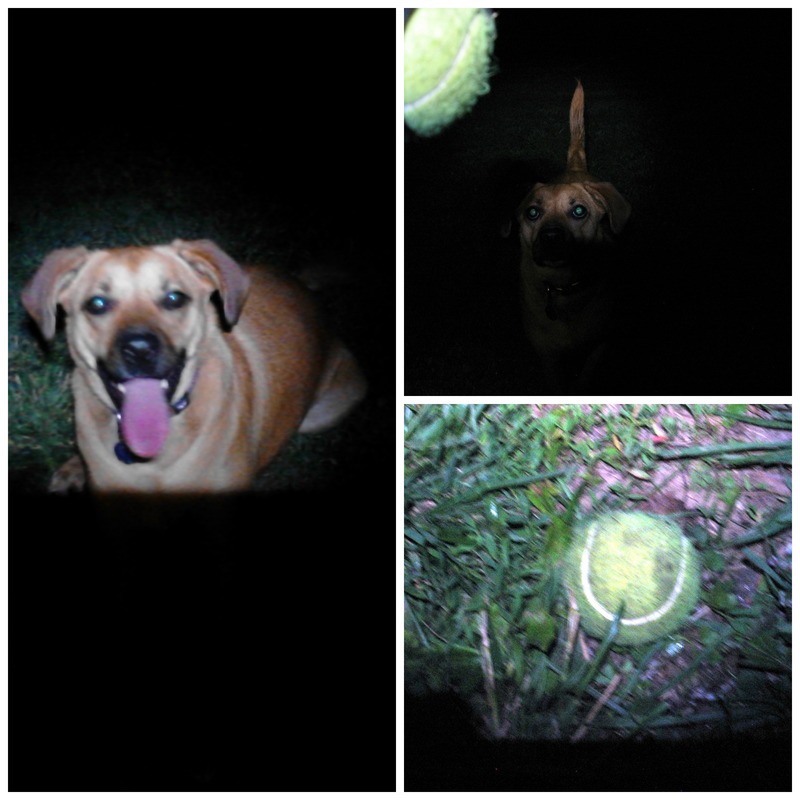 What’s even more cool is, I can use my new headlamp for playing fetch with the dogs after their walk or I can use it when the electricity goes out during a thunderstorm. The hands-free feature is the best part because my hands are fairly busy operating my wheelchair and having to hold a light or strap a light onto my chair is just cumbersome. Jazzy, our BMC mix, loves to play fetch after her walk. Now I can actually see the ball when she brings it to me. Look at that happy face! Ever since I got the headlamp, the weather has not been the greatest or my schedule has been crazy busy. The few instances where I have been out with it have been so much fun! I feel so much safer and confident taking the dogs for a walk. I’m loving the better relationship between me and the dogs that includes better understanding from me and more obedience from them. I’m curious, what would you do if you had a headlamp? What kind of fun activities can you think of? Leave me a comment! Hmmm….reading in bed? I’m not really a nature-outdoorsy kind of girl so night time adventures are pretty much out. 😉 You look cute in your head lamp! I actually don’t think that reading in bed is a bad idea at all. It makes more sense than those book lights. I bet the lowest setting would totally work for that. What a good idea, I would have never thought of that.